So some might know I often post translations of Ace Attorney news and other articles here, but there's still a lot of untranslated, or only partly translated/summarized material about the series out there. And that incudes interesting blog posts, interviews and other things where the creators of the series talk about the development of the series and how they came up with their ideas. And that's why I made a blog to serve as a place for translations of those articles: Gyakuten Saiban - Ace Attorney Library. My plan is to post complete translations there of all kinds of articles about the Ace Attorney series: from the original GBA Justice for All developers blog, to more recent interviews, as long as it has to do with the development of the game series. It should provide insights in how the games are made. I focus on complete translations, because that shows everything in context: how often haven't you seen someone say "I heard that X said...", without really understanding in what context it was said and what X really meant? Updates will be irregular and not following any (game) order. Last edited by Ash on Thu Jul 14, 2016 2:33 pm, edited 1 time in total. Oh yes, please! I've had quite a few people ask me about such interviews and posts, but I couldn't give a firm answer. Thanks as always, Ash. Anyway, the plan is to have at least one bigger article for every game, and then things like interesting blog posts (if available). Like the update today: it's one written by Takumi about Yamazaki (who is now running the Ace Attorney circus), back when he first joined the company and worked a planner. The idea he mentions is kinda... surprising. Takumi totally stole Yamazaki's idea! Takumi totally stole Yamazaki's idea! Galileo Naruhodou. I guess Yamazaki's dream of taking Ace Attorney to space was realized after all. But wow, so he was the inspiration for PLvsAA, aside for whatever Hino had planned. Reading these articles with the Power of Hindsight is pretty interesting, so I hope I'll find more of these little surprises. I'll probably have another big article ready tomorrow. After that, updates will be muuuuuch slower than these first two days. Added a long interview with Takumi (and Hino) about Professor Layton VS Ace Attorney: in the past, I posted a very short summary of this article on the forums, but obviously, the complete translation is much more informative. - Suekane didn't only work on character designs, she basically created the Edgeworth and Mia we know now! - The True Origin of how Takumi created the first game! - The trilogy was never planned as a trilogy! 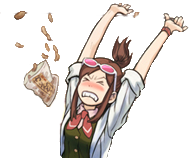 - Why Ema wasn't the protagonist in AAI! - How Takumi came up with the idea for Dai Gyakuten Saiban! - How Takumi came up with the characters of Dai Gyakuten Saiban! - How they decided to make Professor Layton VS Ace Attorney! - Why the judge is always called サイバンチョ　in the game instead of サイバンチョウ! - Naruhodo (Phoenix)'s original name! - The truth behind the class trial! - How they made the testimony sync with the music in the first episode of AA6! - A early version of Reifa! - The favorite AA6 characters of the development staff! - What kind of women art director Fuse likes! - The one blog entry where Takumi wrote about his mother. - An interview discussion where Takumi talks about mystery fiction and the books that have inspired him and the Ace Attorney series. I wish Takumi had more conversations from the characters' perspective. It's really amusing to read his dialogues. Btw, was the "objekshon" bit a call-back to one gag comic he drew of Nick and Prince Edgey, and the 異義あり? Actually, the column was written years before that comic; that comic was made for Turnabout Crossover (which came with AA1DS). So it'd have be the other around, though mistaken 異義あり for 異議あり is common a mistake (like he said in the column, even the filename was wrong), I think it doesn't need to be any specific reference. As for more non-game dialogues/character interactions, I think all, or at least most of Takumi's columns for Dreamaga contained similar short scenes where the characters would interact. Short question: Would people want to see an semi-long interview about AA1DS (about the US release, and making of Rise from the Ashes) first, or a really long one about GK2 (about pretty much everything)? Update today: You remember the time when the first Gyakuten Saiban was so friggin' horrible nobody had anything good to say about it? And the time the game was actually canceled for a moment? - Takumi's favorite mystery novels, that also influenced Ace Attorney. - The very first blog post by Takumi for the first game! - Takumi talks about the time the first game was canceled! - A very long post-release interview about AA6, where Yamazaki and Eshiro talk about the original concept of the game, scrapped concepts, the story behind the role of the old, and the new characters in AA6, and much, much more. - An interview with six members of the development team about their favorite scenes, music and also who they like to see back in future Ace Attorney games. - The origin of why Maya is a spirit medium in the first game. - Takumi's favorite Columbo episodes, and how it influenced his writing of characters in the game. Does anyone have anything in particular they want to see/read about? I can't make promises, but I can try and look if anyone's looking for some specific piece of information they want confirmation on. - Yamazaki explaining how he came up with the main theme of AA6 (includes awesome concept art). - Scenario-writer Fukuda explaining in detail how the actual scenario is created. - An interview with six members of the AA6 development team, where they talk about the actual circumstances on the dev floor and also the private dev team webpage (includes a Valentine Day's card with Mia)! - Takumi telling about how he really didn't want to do AA4 initially, and why he had a new protagonist appear in the game. A lengthy interview with Takumi, producer Matsukawa and character designer Nuri about Ace Attorney DS. They talk about how it was originally only planned for an overseas release, how Takumi REALLY hated adding a new episode, how Takumi REALLY hated adding new game mechanics, about his thoughts about the original GBA game and about character designs for the new episode. Also important trivia: Sal Manella was the substitute character they used for GANT for most of the development cycle (before the sprites had been made). SAL. With the lines of GANT. Just imagine that. Well, if you're offering... do you know which interview it was when Takumi first introduced Pess? I recall it's an oldie but goodie, but it's been difficult to locate particular interviews. Also, if you can, I'd like more interviews with Tatsuro Iwamoto. Wasn't there one where he mentioned his Okami influence? I happened to have that one page somewhere, so here! It also talks about Edgeworth's habit of singing karaoke and his favorite music genre. I don't think I will do many of the character-focused things on GS Library though, as I'm trying to focuson the actual development of the games. Though you can really find a lot about these kinds of things in the fanbooks and guidebooks, I think, like random comments about the elder von Karma sister (even though Iwamoto is of the opinion it's a brother and has already drawn him). I'll see what I can find, I have one already for the 3DS Trilogy, and I still have to see what he wrote for the AA3 blog. By the way, I am not sure what interview you are thinking of, but Iwamoto actually worked on Okami (he worked on character animation). Perhaps you're thinking of that? Yes, Takumi also thinks GS1 is the best arc in the series. I'm kinda glad to see him admit that tbh cuz as much as I like 2 and 3 and then less with the later games I think GS1 is a much better plot than the rest. He even admits what everyone says that he was inexperienced and it shows whereas he better knew what he was doing eith the later games. But it's funny I remember having arguments with people years ago about whether the series have gotten more japanese and someone always broke in to say it was nonsensical because it's a japanese game with anime graphics, but I insisted and here it is; AA1 was designed to be accessible to western players whereas 2 and 3 embraced the japanese-only audience after AA1 did not ship overseas. Explains what I mean when I say I think PWAA is more down to earth than the latter entires. If you read all the material about the first game, you'll also notice that that game actually had A LOT of input and feedback from people other than Takumi. Most of the basic character relations were advocated by Suekane (main character designer) and (presumably) Mikami (Production Studio 4 boss) for example, while Inaba also did a lot to get the game in the current form (with SURVIBAN being quite different in tone (and even gameplay) compared to the current game). I posted an extreeeeeemely long interview about Gyakuten Kenji 2 today. I'm fairly sure it has never been translated (and perhaps not even referenced) before and it is about basically everything, from feedback to the first AAI, to how the second game was made and collaboration projects with GK2. I think it's also worth reading if you're just into the current Ace Attorney games, because it also explains a lot about the marketing campagins of the AA games Eshiro produces (so also AA5/6). Yamazaki likes Heavy Rain!? I would've never expected that! I wish Takumi had more conversations from the characters' perspective. It's really amusing to read his dialogues. I got my hands on the Dreamaga columns by Takumi yesterday, and yeah, they are exactly what you're looking for. Random slice-of-life dialogue segments, like one where Nick, Maya and Edgeworth are having a meal in the courtroom cafeteria, or one where Nick, Maya and Larry talk about Valentine's Day and even one about Mia and Diego the day before Mia's first trial. So these segments are pretty much the way to see more of the everyday life of the characters. And no... I'm not going to do them for GS Library, as they don't really fit the goal of the blog. Could you please send them to me via PM then? I'd be happy to share them on my blog instead, so it won't get too cluttered in here. Can you scan them? If not, it's fine. Uploaded photos are fine too as long as the quality is clear enough to be read. Sorry, it's a bit inconvenient for me to do so (it's also almost fifty pages). You could purchase 『逆転裁判ファンブック　なるほど逆転裁判』, which has reprints of the first run of the columns, which is what I did. (The book is OOP though, so you need to find a used copy). - A long interview with Takumi, producer Matsukawa and character designer Nuri about the first DS port. About how it was made for the US, about how Rise from the Ashes was made, and looking back at the original game. - The interview where Takumi talks about his Edgeworth headcanon, which incudes a pet dog called Pess and singing karaoke with the von Karmas. - The post-release interview with Yamazaki and Eshiro about Gyakuten Kenji 2, where they talk about everything. From character and story design, to the marketing campaign and other things. Also digs a bit deeper in the question why Yamazaki and Eshiro are always fighting. - Graphic artist Fujii explaining how those still event cut scenes are made in AA6. He shows off how a crime scene photograph is made out of scratch. - Takumi explaining how he wrote The First Turnabout, and about the roles of Frank and Larry. 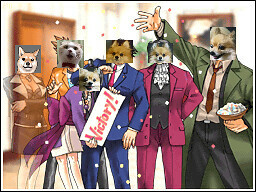 - Post-release interview about AA6 with the big staff. Includes an interesting discussion about the direction the series could take in the future. Continuing the current story? Soft reboot? Different genre? Who knows? - Takumi explaining while the first game was set in 2016. - Discussion between Takumi and mystery writer Ayatsuji, where they talk about how their work as writers is quite different. - Interview with Iwamoto for the 3DS Ace Attorney Trilogy. Talks about working on the original three games, both as a graphic artist as well as... voice actor. He even mentions Franziska's unnamed sibling. Last updates of this week. Besides a series of blog posts by Takumi about a field trip to the courthouse with his team, and the conclusion that he doesn't care the game isn't realistic in its portrayal of the law, I also added an interview about Project X Zone 2. Also: do you remember the time when Takumi had to cut out A WHOLE EPISODE out of the second game because they didn't have enough space, and then used that same episode in the third game (Recipe for Turnabout)? The Recipe for Turnabout post also talks about Takumi's personal ranking of importance of episodes, and the origin of Gumshoe's lunchbox. Spoiler: it actually exists. Next week, I'll be looking at.... the people behind the games you usually don't hear about. Programmers, people working on sound effects and backgrounds. So none of the usual suspects. As I said in the last post: I focused on the less obvious development staff members this time. First we have three AA6 blogs: Akitsuki about game effects (with concept art), Ishikawa about the background design (with concept art) and programmer Hirata about the script tool for the game. And then I have some things about the first game. First a pre-release interview with producer Inaba (producer of the first three games). And there is a three part series of blogs by Takumi about the whole team (of seven + 2 producers) that created the first game. He explains the roles of each of them and how they helped to shape the game (part 1, part 2 and part 3). If people have specific things they want to see: ask, and I'll see what I can do/find. And if you can provide sources to translate (about the development): always welcome. No requests for topics people want to read about? (So I can look for them). I'm almost ready with most of what I want to do. While I still have a very large portion of the blog posts for the first three games waiting for me, I'm actually mostly done with the games after that. While not everything I've prepared has been posted yet, I have major interviews on each of the games after AA4 ready (or already posted), and I have done most of the interesting blog posts for those games too (I am considering one or two more from GK2 and AA5, but most of them contain information repeated in interviews/other blog posts). Suekane contributing a lot to the identity does no surprise me considering she left to write manga. I also thought it was very noticeable in T&T already how many new characters looked different in style from her designs or how Grossberg's co-council drawings looked strange for instance. I wonder how much input Kazuya Nuri has in defining the personalities and character relations of the designs he makes. I know he is a stickler for detail and cares a lot about the minutiae of his own art but I don't know how much he personally put into the writing of Ema Skye for instance. Exactly one-third of all the characters of the first game were already designed by Iwamoto though, so it's not like his style wasn't part of the original charm and style of the game. Grossberg was actually one of Iwamoto's designs. - A long post-release interview with director Takumi, producer Kojima and art director Nuri about DGS. They talk about the early days of the project, shaping the world of DGS, voice acting, motion capturing and stuff. - Part 1 and Part 2 of Takumi's columns on writing Turnabout Sisters. Includes the original names of the characters and the explanation of an element of the story design that many consider part of the series' DNA (actually, Mori of SE had been telling Takumi to do that the whole time; Takumi just didn't listen to him). Thank you, Mr. Mori, for haunting Mr. Takumi 'til the very end (of that conversation). Does he have a particular dialect? I see you translated his lines with a certain drawl to them. - A spoilerific interview from the AA6 Official Visual Book, about both story and character design. Best read after playing the game. - A long interview on AA5!. How the project was started, deciding on using Phoenix again, deciding on new mechanics and characters like Athena (and her name), the 2D-like 3D graphics and more! - There are some famous typos in the localized version, but Takumi is quite at them too. In this blog entry for AA2, he talks about those unsung heroes who have to hunt for Takumi's many typos: the bug checkers[url]. - The Capcom Legend interview with Nuri for DGS. Nuri talks about his career at Capcom, about working on the series, on the characters he created and DGS in detail. I'm basically through my stash of interesting long interviews on the game, so from now on it'll mostly be blog post, unless someone can point me to something interesting to translate (and recommendations are welcome!). Edit: Oh, I also have these two extra pages, which can be interesting for some. This one lists all the scenario writers for each game, while this page lists all producers and what they did for the games/franchise (this one was added today). Slow week this time. Like I said last time, I all basically have left now are the dev blogs, so unless someone can point me to something interesting (that's not already addressed on the blog), I'll just work my way through the blogs. - Part 1 and Part 2 of Takumi's developer blogs on writing Turnabout Samurai. Oh, forgot to post the update here, but GS Library now also has the two blog posts on writing Turnabout Goodbyes (and that means I have all the episode-related posts for the first game now). I'm not doing updates as regularly as first, but lately, I've updated Gyakuten Library with Takumi's columns on Turnabout Memories, The Stolen Turnabout and Turnabout Beginnings, as well as a long interview with both the producer of the Ace Attorney series (Eshiro) and the producer of the Danganronpa series of Spike-Chunsoft. Hi. Thanks for the reads! I greatly enjoyed the articles! Good job, keep it up! One thought on the AA6 article. I don't think this is a spoiler. I never thought about Turnabout Time Traveler as the first case where all three of the "Samurai Bros" were in court together. Still doesn't boost it in my appraisal though (I consider it pretty much right down there with Turnabout Corner and The Monstrous Turnabout).